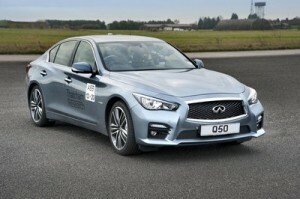 So the Infiniti Q50– Whats the lowdown then? Infiniti: it may not be the best known of manufacturers – and it probably isn’t the first port of call for anyone looking for car lease deals on executive saloons. In fact, the new Infiniti Q50 warrants close attention for anyone looking at models such as the BMW 3 Series, Mercedes C-Class and Audi A4. There are a few very good reasons why the Infiniti Q50 should be able to carve a niche for itself in this market. For one thing, the car offers impressive performance coupled with respectable levels of efficiency. The build quality is high enough for this car to hold its own against the likes of Audi and BMW. What’s more, there’s a degree of practicality with the Infiniti Q50 that makes it ideal not just for car-pooling but also as a useful family car. So far as engine choice is concerned, Infiniti has kept it very simple (for the time being at least). If only diesel will do when you’re looking for car leasing deals, you’ll head straight for the 2.1-litre 168bhp turbo diesel model. This offers just over 64 mpg on the combined cycle with emissions of 114g/km of CO2. If fuel economy is close to the top of your list of priorities when looking at car lease deals, you’ll note that these figures compete very favourably with the offerings of Infiniti’s competitors in this area. Rather than offering a ‘straight’ petrol alternative, Infiniti instead offers a hybrid model that combines a 3.5-litre V6 petrol engine with a 50kW electric motor that uses a lithium ion battery to store regenerated energy. According to Infiniti’s figures, expect to get 46 mpg on the combined cycle with 144g/km in emissions. If acceleration is what you’re interested in, you’re possibly more likely to opt for the hybrid. This model promises to get you from rest to 62 mph in an impressive 5.1 seconds. To further aid with keeping fuel consumption as low as possible (especially in urban settings) each Q50 comes with stop-start technology. As well as being quick off the blocks, drivers should find that the addition of features such as adaptive steering make handling the Q50 a pleasing experience. Take it for a test drive and you should find that in terms of a refined drive, it measures up well against the 3-Series and A4. The immediate predecessor of the Infiniti Q50 was the G Saloon. The Infiniti Q50 is slightly longer and wider. It also boasts a pleasingly low stance and an overall sporty presence. The net effect of this is a distinctive silhouette that lends the car its own individual character. Full LED lighting comes as standard and a distinctive grille further helps the Q50 stand out from the crowd. The cabin is suitably luxurious and decked out with the type of features you’d expect when considering car leasing deals within this class. Twin LED displays are situated at the top of the centre stack. One of these deals with traditional functions such as navigation while the other covers various extras – such as housing Infiniti’s very own infotainment system. Various functions are mounted on the steering wheel with the option of using manual switches for these controls as well. The Infiniti Q50 boasts a 500-litre boot, which is one particular advantage over the likes of the BMW 3 Series and the Audi A4. Lowering the rear seats can increase storage further. With a widened build, you should find plenty of room in the rear for three adults. The various high-tech features on this car are designed to enhance safety as well as comfort. For one thing, The Around View Monitor (courtesy of Nissan) is ideal for checking the presence of pedestrians (something that may come in especially useful on the school run). The Active Lane Control on the other hand is all about preventing you from ‘drifting’: it scans the road for lane markers and lets you know when you’re veering outside them. Expect to pay in the region of £28,000 if you’re considering outright purchase – although opting for car lease deals should remove the need for a hefty initial outlay. So would you consider Infiniti as an alternative to the likes of the BMW 3-Series? What do you think of the Infiniti Q50?